I’ve heard the term grace throughout my life although the definition seemed like a slippery eel, present for a brief moment than unceremoniously disappearing within the recesses of my mind. I’ve always known that grace had something to do with God’s blessings but whether or not grace was something I could strive for or needed to earn by doing good deeds totally escaped me. 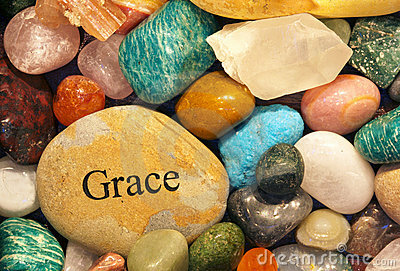 In doing the requisite internet search there were a few definitions of grace that resonated with me. “Grace is the free and unmerited favor of God as manifested in the salvation of sinners and the bestowal of blessings”. “In Western Christian theology grace has been defined not as a created substance of any kind, but as the love and mercy given to us by God because God desires us to have it, not because of anything we have done to earn it”….. So what does grace mean to me? How is grace manifested in my life? Would I recognize that I was the recipient of God’s grace or would I continue to blindly stumble along my own path ignoring that voice in my head that often serves as God’s messenger? You know what I mean. When we are faced with a choice, and by choice it could be as simple as deciding whether or not to go through that yellow light or to stop and wait for the light to turn red. In a split second most of us hear that small voice in our heads that we often try to quiet based on our intentions. If we are late for an appointment we might ignore it as getting to that appointment on time throws caution to the wind, if it is a lazy afternoon, well we can wait for the next light. That inner voice forms the essence of who we are. Some feel it is the balance between our id, that devil may care part of our being, and the superego, the rule maker, or governor of our conscience. In other words our inner voice can be viewed as the balance between right and wrong. Grace comes to us in many forms and it is not always easy to recognize. Although this is clichéd, we must become our own best friend in order to become more intuitive and in tune to the myriad choices we have to make every day. If we really pay attention to that inner voice and change our dynamic from that of a harsh critic to a confident friend, and protector, we would invariably make the right choices. If the journey feels right chances are it is right. If at some point the tide seems to be changing take stock and then a deep breath. Step back and take a break. Listen to the voice in your head. As long as you know you’ve done all that you can do, if that path is meant for you, God’s grace will see you through. Very well said. As the saying goes, the struggle is real 🙂 part of my journey has been to get to know and love myself. Not to look for happiness to stem from what others can give to me, but first from what I can give to myself. As my relationship continues to evolve with God and with myself, that inner voice tends to get clearer; the second guessing less prevalent, a reassured confidence manifests. I believe that God’s grace is present in us and around us everyday. It’s just a matter of how we choose to love our lives and what we choose to see.